LONDON--(BUSINESS WIRE)--Technavio analysts forecast the global dental X-ray systems market to grow at a CAGR of over 4% during the forecast period, according to their latest market research report. However, the growth momentum of the market is expected to decelerate due to a decline in the year-over-year growth. The increasing demand for cosmetic dentistry is one of the major trends being witnessed in the global dental X-ray systems market 2018-2022. The dental cosmetic industry has gained fame over a period. It aims to improvise the appearance of the teeth, gums, and bites. Millennials and baby boomers are primarily responsible for the growth of cosmetic dentistry. The increasing demand for cosmetic dentistry has fueled the need for better dental X-ray devices. The rise in the prevalence rate of oral diseases along with increasing demand for oral care is expected to drive the market growth. Poor diet, chewing of tobacco, consumption of alcohol, and poor oral hygiene are some of the main reasons for the tooth decay and high rate of oral diseases. According to the NHS, approximately 22 million people in the UK received oral care from an NHS dentist once in last 24 months till September 2017. The global dental X-ray systems market research report provides market segmentation by product (analog dental X-ray systems and digital dental X-ray systems) and by region (the Americas, EMEA, and APAC). It provides an in-depth analysis of the prominent factors influencing the market, including drivers, opportunities, trends, and industry-specific challenges. The analog dental X-ray systems segment held the largest market share in 2017, contributing to over 55% of the market. This product segment will dominate the global market throughout the forecast period owing to the presence of a wide range of products, a growing number of companies, and a high adoption in developing and underdeveloped countries. The Americas held the largest share of the market in 2017, accounting for more than 44% share. It was followed by EMEA and APAC respectively. The increase in the prevalence rate of oral diseases, raising awareness about oral health care, and increasing healthcare expenditure are some of the factors driving the market in this region. 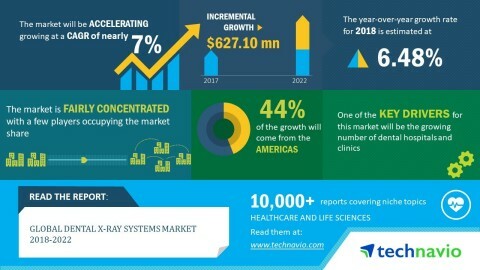 Technavio analysts forecast the global dental X-ray systems market to grow at a CAGR of over 4% by 2022.